I say that, because the central conceit in Jupiter Ascending is pretty much the same as in The Matrix: the villain wants to harvest the human race, just like the robots in The Matrix. It makes the directors come across as kind of one note. Think about it, this is the first original film they’ve produced since The Matrix, with their other films in-between being adapted from other sources. And the script is definitely where the deficiencies lie in Jupiter Ascending. The story focuses on Jupiter Jones (Mila Kunis), and no, she’s not playing the same character from The Three Investigators. Jupiter is the most beautiful cleaning lady in the universe and apparently is the exact genetic match of the deceased matriarch of the Abrasax family that controls much of the universe. When the matriarch died—some say she was murdered—possession of Earth passed to her son, Balem (Eddie Redmayne). Now that the matriarch has seemingly been reincarnated in the form of Jupiter, Balem will stop at nothing to wrest control of Earth back from her. Also in the mix are the matriarch’s other children, Kalique (Tuppence Middleton) and Titus (Douglas Booth). So, the film is one big chase film—an overly complicated chase film, but a chase film all the same. Bounty hunters stalk her, but she is protected by Caine (Channing Tatum), a “splice” who is basically human with wolf traits and an unstoppable killing machine with hover boots that allow him to roller skate on air. That description is possibly the clearest and most concise one you’ll get on the plot of this film, because The Wachowskis do everything in their power to crap it up throughout. This story is very convoluted and way too big for a single two-hour film. It probably should have been a novel—some would say it already is a novel called Dune, and the similarities are definitely blatant. In fact, part of the problem with Jupiter Ascending is that it borrows too liberally from other films. Jupiter’s arc—if you can call it that—as well as some of the film’s aesthetics, echo The Wizard of Oz, while the score screams Star Wars, and the most damning rip off of all is the one The Wachowskis perpetrate against themselves with the central conceit. Jupiter is a terrible heroine. She’s completely gullible and constantly states the obvious—more points for the shoddy script. Yes, films like this need to have a gateway character who serves as the audience’s way into the story, but I don’t need her to be Captain Obvious. Also, as I alluded to above, she has no real arc. Jupiter learns something that should massively change her life, but she goes back to her simple life as if nothing really happened. The story would have been more interesting if she took ahold of her new life and forged a new destiny. Really disappointing. The saving grace of this film is the visuals, which are definitely beautiful. However, much of the action is soulless and mind-numbingly boring. I was reminded more than once of Star Wars Episode II: Attack of the Clones and the long, boring chase on Coruscant. There is a similar scene—big surprise—in this film where bounty hunters and Caine get into a giant firefight above Chicago, blowing up buildings and such. It looks great…except for the fact that it appears through most of it that Chicago is devoid of citizens. It’s just lazy filmmaking, but juxtaposed with pretty visuals. The cast is completely wasted in this film. Kunis has zero charm, which is unusual for her. I felt the same with Oz the Great and Powerful—maybe she should just steer away from these genre pictures. Tatum is an exposition machine as is Sean Bean as his mentor. Eddie Redmayne is more than likely praying no one sees this film, as his performance will probably negatively influence Oscar votes for his performance in Theory of Everything. 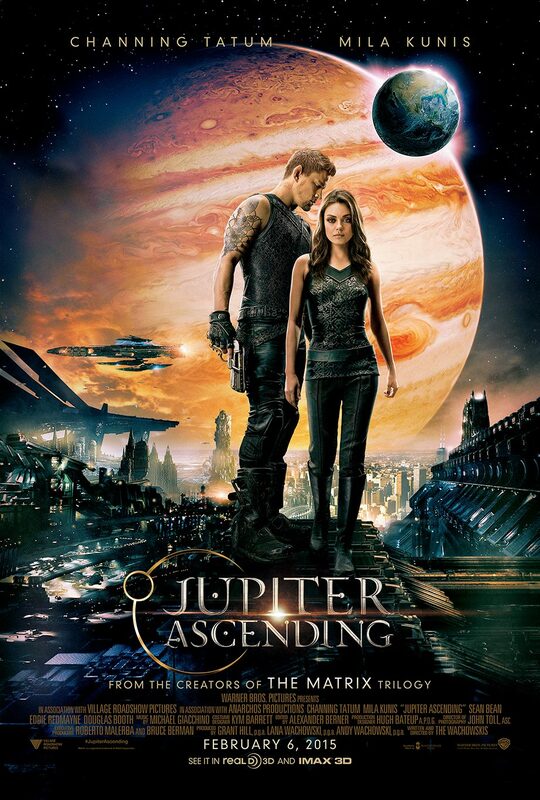 Overall, Jupiter Ascending is a beautiful disappointment. Some of it is very bad to the point where my eyes almost rolled out of my head. It’s just too convoluted and boring for anyone to really care about what’s happening on the screen. Just a huge mess. Skip it. This entry was posted in Reviews and tagged Channing Tatum, Eddie Redmayne, Film Reviews, Films, Hodgepodge, Jupiter Ascending, Matrix, Mila Kunis, Movie Reviews, Movies, Podcast, sci-fi, Star Wars, Wachowskis. Bookmark the permalink.